Multi Photo Quotes is a screensaver designed for multi monitor computer systems - but working on one monitor systems as well - that can display images, quotes or a combination thereof. At its core stands the possibility to display images. An image can be displayed across all computer monitors, on one monitor in fullscreen or in one grid of the monitor. Grids can be defined in the program's options. That could pose an excellent idea to use the screensaver as a photo wall. The display is automatically changing every 30 seconds. This can be changed in the options as well. 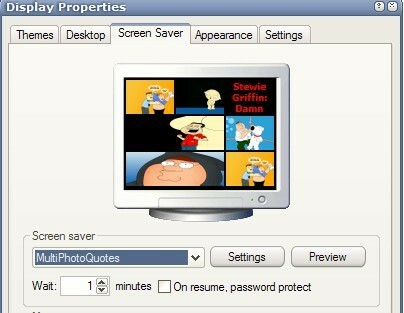 The screensaver software comes with the ability to add quotes automatically to each photo set. Quotes are taken from so called quote books. Five of them are installed on the computer during the screensaver installation. Those books are simple text files that contain one quote a line. It is therefor easy to add a custom quote book or edit existing ones. The options of the screensaver are quite extensive. The program offers extensive options to configure the display of the quotes and images. This ranges from selecting the right fonts for the quotes to configuring minimum and maximum sizes for photos on the screen. One main application for Multi Photo Quotes could be to install them on family computers to display family photos (and quotes) whenever the screensaver becomes active. Very attractive (catchy) screen savers. It should be obvious by now that KDE has this software built in!